The first accurate map of the Lower Congo River, Africa. A Chart of the River Zaire, the lower part from the Mouth to Embomma, corrected from Maxwell's Chart, and from thence to the Narrows at Numaza Cove. A fine example of James Kingston Tuckey's 1816 map of the Congo River from its mouth to Soondy N'Sanga, or modern day Nsundi. 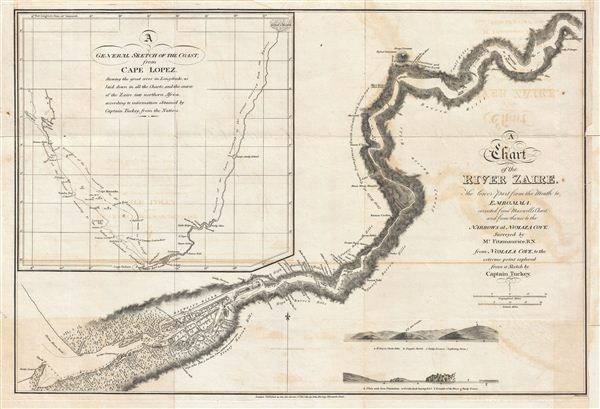 The map features depth soundings at the mouth of the river as well as copiousnotes throughout illustrating indigenous villages, geological features, and the character of the River. Two depth profiles appear in the lower right quadrant. A large inset in the upper left quadrant details the coast of Africa from Cape Lopez to the mouth of the Congo - a region that has been incorrectly charted until the appearance of the present map. This map was based on Tuckey's own sketch, surveyed by Lewis Fitzmaurice, engraved in London by John Walker, and published by John Murray. James Kingston Tuckey's important 1816 map of the Congo River (River Zaire) represents the first scientific attempt to map the interior of Central Africa and the Congo. The Tuckey expedition followed immediately upon the close of the Napoleonic Wars. This was not by chance. Soldiers and naval vessels, no longer needed for war, were reassigned to exploratory missions around the globe. At the same time, the arrival of the Industrial Revolution in the early 19th century transformed the means and style of production. The Industrial Revolution had wide reaching global implications. For Africa this meant a reduced reliance on slaves, an institution that was becoming ever more unpopular on the continent, and an increased focus on raw materials. european powers were no longer content to trade slaves at coastal enclaves in West Africa; instead they began to view Africa in terms of territorial conquest, mineral resources, forestry, and animal products. To exploit the presumed wealth of Africa, european powers needed to better understand the Continent's interior, particularly possible trade arteries, the navigability of the continent's great rivers, and exactly which resources they could expect to find. The 19th century thus fostered a rush to explore the mysteries of the 'Dark Continent,' leading to the Great Names in African exploration, Henry Morton Stanley, David Livingstone, Richard Burton, and John Hanning Speke, to name just a few. Among the first of these and certainly the first scientific penetration of the Congo, was the Tuckey expedition of 1816. Tuckey was most likely not the best choice to lead an expedition into the Congo. A career navy man Tuckey had contracted chronic hepatitis and most likely malaria on missions to India and the Red Sea. After some nine years in a French prison, he was assigned to be the leader the an expedition to determine the navigability of the Congo, as well as discover if it communicated upriver with the Niger, which had already been partially and tragically explored by Mungo Parke. The well-equipped expedition started off well and with great expectations. The Secretary of the Admiralty, wrote, 'there never as in this, or in any other country, an expedition of discovery sent out with better prospects or more flattering hopes of success than the one in question.' They had a specially made shallow draft ship, the Congo as well as a supply vessel. Moreover, the 56 member expedition team included specialists in all areas from botany to surveying. The expedition initially met with some initial success when its surveyor, one Lewis Fitzmaurice, identified that the west coast of Africa between Cape Lopez and the mouth of the Congo River was some 20 to 40 miles out of latitude on most charts - as illustrated on the large inset in the upper right corner of the presently offered expedition map. Arriving at the swampy mouth of the Congo River, the Congo and its crew began a slow progress upriver. Along the way, diaries recovered from the expedition include meticulous depth soundings, survey work along the river, studies on indigenous linguistics, and in depth cultural commentary. This significant work was the first accurate description of the lower Congo. The expedition eventually reached the Yellala Falls, beyond which they could progress no further by boat. Tuckey and part of the expedition began to work their way overland following the course of the river. Against near impossible odds, ill health, and other hardship, the expedition trekked nearly 172 miles inland to a place they called Soondy N'Sanga, or modern day Nsundi. Here, having fallen ill himself and lost several expedition members, Tuckey ordered the expedition to turn around. The falls and rapids of the lower Congo seemed to prove that the river was not navigable. Had Tuckey the constitution to travel inland roughly twice the distance he actually traveled, the team would have discovered the Stanley Pool (Pool Malebo), beyond which the Congo is easily navigable. As it was, Tuckey succumbed to his illnesses, possibly Yellow Fever, upon reaching the coastal city of Moanda. Tuckey's maps and his surviving journals were returned to London where they were published by the Royal Geographical Society. Lewis R. Fitzmaurice, the expedition's surveyor whose name appears on this map, was the sole surviving expedition officer to return to London. Though largely considered a failure, the Tuckey expedition inspired the next generation of African explorers to unlock the mysteries of the Congo. It was not until some 40 years later that Henry Morton Stanley fully mapped the river. This map is an important artifact and represents the first scientific effort to map the Congo River and the interior of this part of Africa. A must for any serious Africa collection. James Hingston (a.k.a. Kingston) Tuckey (August 1776 - October 4, 1816) was an Irish born British Naval officer and explorer active in the early 19th century. Tuckey was the son of a Protestant reverend, James Kingston, of Donoughmore, Ireland. Both of his parents suffered untimely deaths and he was subsequently raised by his grandmother. Turning 17, Tuckey, inspired by a family naval tradition, joined the Royal Navy. His naval career was marked by continuous front line action in various theaters, including the East Indies, India (where he developed Hepatitis), the Red Sea, and Australia. In Australia he was commissioned as the First-Lieutenant of the HMS Calcutta and published his adventures in the 1804 The Account of a Voyage to establish a Colony at Port Phillip in Bass's Strait. In the following year, the HMS Calcutta was captured by French forces and Tuckey, along with most of the other officers and passengers, were imprisoned in the French Citadel of Verdun, where met his wife Margaret Stuart, a fellow prisoner, and prepared Maritime Geography and Statistics, published shortly after his 1814 release. Tuckey's two published works reveal the mind of meticulous and scientific geographer. Tuckey was next commissioned to lead an exploratory mission up the Congo River (or River Zaire) with the mission determine if it communicated with the Niger River. Some of suggest that this commission was viewed as a reward or at least compensation for his long imprisonment, but in fact, given his poor health, it was nothing short of a death sentence. Nonetheless, Tuckey took to the command and the expedition was launched early in 1816. The team reached as far as Nsundi (on map as Soondy N’Sanga), where they were forced to turn back by lack of supplies and general expedition-wide ill health. Most of the expedition ultimately suffered from various tropical illnesses, including Tuckey himself, who died on October 4th at Moanda, on the coast of today's Democratic Republic of the Congo. Tuckey's journals were subsequently published verbatim by the Royal Geographical Society. Curiously, the Tuckey Expedition, though a near total disaster, inspired further British interest in African exploration. Tuckey is sometimes referred to as John Hingston Tuckey. We have been unable to definitively determine which name is correct. Tuckey, J. K., Narrative of an Expedition to Explore the River Zaire, Usually Called the Congo, in South Africa, in 1816, (London: J. Murray) 1818. Very good. Right margin extended. Some transference. Backed with archival tissue. New York Public Library, Map Division, Map Div. Sc Rare 916.75-T.